For such an important and widely published author, we know surprisingly little about Hervieux de Chanteloup, whom we met in History 9. The Biographie Universelle (1840) devotes just a single paragraph to him. To make matters worse, many of the ‘facts’ that you will read in bird books are wrong. I will do my best to set the record straight. 1. Even his full name is a mystery. It is normally printed as J.C. Hervieux, with the ‘J.C.’ commonly believed to stand for ‘Jean Claude’ (I’ve seen no proof of this). However, Tim Birkhead (and others) name him as Joseph-Charles Chastanier Hervieux. Normally I would back Tim to get it right, but on this occasion he has confused the name with Joseph-Charles Chastanier, a printer and bookseller in Avignon who published the 1711 edition (1). Fortunately for us, Hervieux is generally known simply as . . . Hervieux. 3. No portrait of him is known to exist. 4. Hervieux was only 24 when his first book, Traité du serein de Canarie was published in 1707. His second book, with a confusingly similar title, Nouveau Traité des Serins de Canarie, was published in 1709. 5. It is frequently claimed that his first book was published in 1705, but I can find no trace of it. The Privilège de roi (the King’s authorisation) for the two books was not issued until 1706 and 1709 respectively (3). The most plausible explanation is that if anything existed in 1705, it was in the form of a manuscript. 7. Another common fallacy is that he was governor of the aviaries of the Duchesse de Berry. His patron was actually Ann of Bavaria, the uncomplaining wife of Henri-Jules, Prince de Condé, whose erratic behaviour descended into madness in later years. She enjoyed the title of ‘Madame la Princesse’, which is printed on the title page. The Nouveau traité des Serins de Canarie is dedicated to her. 8. Tim Birkhead suggests that Hervieux was employed by Madame la Princesse some time in the 1690s, but this seems improbable not only because of his age (he would have been only 16 by the end of the decade), but also because there is no mention of her in the Traité du serein de Canarie. It is more likely that his book brought him to her attention and that she supported the publication of the much more ambitious Nouveau Traité des Serins de Canarie. His obsequious dedication in the latter makes his gratitude very clear. 10. The book contains three illustrations: two music scores for the flageolet to teach canaries to sing a simple tune, and one of a bow-topped bird cage. This pattern was still being manufactured almost 200 years later. 11. Nouveau Traité des Serins de Canarie was the first monograph on the canary. Most books on song birds in the eighteenth and nineteenth century allocated the canary just a chapter or two. No other book was dedicated to the canary until 1875 (6). The Red Canary by Tim Birkhead (2003), p.79. The title page of the 1711 edition of the Nouveau Traite translates as ‘At Joseph-Charles Chastanier printer & bookseller, close to the College of the Reverend Jesuit Fathers’. The Privilège de roi was spelt Privilège du roy (in old French) in the first book. 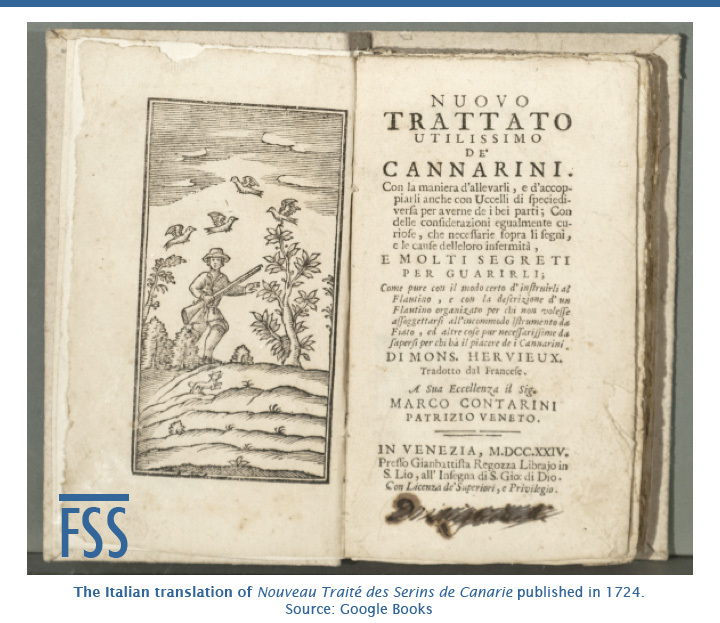 The titles are translated as Naaukeurige verhandeling van de kanarivogels (Dutch); Neuer Traktat von denen Canarienvögel (German); A new Treatise of Canary-Birds (English); Nuovo Trattato Utilissimo de Cannarini (Italian); Tratado sobre o modo de crear os passaros canarios (Portuguese). The Canary Book by R.L. Wallace, first edition, 1875.